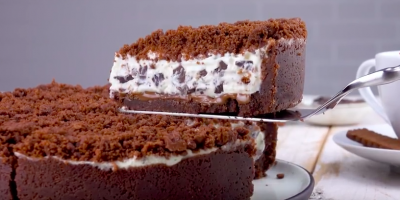 Torta morbida cioccolato e stracciatella senza forno! – Place the biscuits in a resealable bag and crumble them using a rolling pin. Pour them in a bowl together with the melted butter and pour half of the mixture in a second container. – Place the contents of one of the two bowls in a round baking pan, flattening with a spoon and also forming high edges. Refrigerate for 30 minutes. – Then mix ricotta, mascarpone and icing sugar by working the ingredients with an electric mixer. Then add the chocolate flakes turning with a spatula. – Pour the melted chocolate into the center of the cake tin, then cover it with the stracciatella cream. Be careful not to mix the melted chocolate with the white cream. – Finally, sprinkle the cake with what remains of the crumbled biscuits.